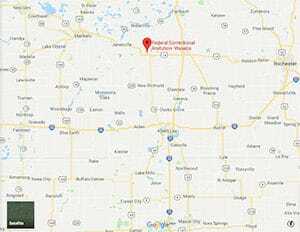 Location: Located in southern Minnesota, 75 miles south of Minneapolis on I-35; 13 miles west of Owatonna on State Highway 57. Background: FCI Waseca opened in 1995 as an all-male facility. It was formerly a University of Minnesota campus. It was converted to an all-female prison in 2008. Notable inmates include former CEO of Enron Corporation Jeffrey Skilling (serving a 24-year sentence for insider trading and securities fraud; transferred to FPC Montgomery), Catherine Greig (pleaded guilty in 2012 to harbouring a fugitive and identity fraud for assisting Irish Mob figure James “Whitey” Bulger evade capture), and Shelley Shannon (serving a 20-year sentence for firebombing six abortion clinics). Housing: Inmates are housed in dormitories consisting of two and four-person cubicles, along with four-person rooms. Health Services: Health services at FCI Waseca include medical sick call, dental sick call, emergency medical services, treatment of infectious diseases, periodic health assessments, routine dental care, chronic care, medications, TB testing, immunizations, physical and periodic health examinations, eye care, health promotion, and disease prevention. While emergency medical care is available 24 hours a day, inmates must submit a triage form to be evaluated for routine health care needs. Psychology Services: Inmates at FCI Waseca are screened by Psychology Services staff within 14 days of arriving at the prison. Inmates who have family or personal problems, or are in a crisis may also be seen for individual therapy. Typical groups offered include Trauma and Life Workshop, Resolve (Trauma and Recovery), Basic Cognitive Skills, Criminal Thinking, and Emotional Self-Regulation. Additionally, Illness Management and Recovery is offered to inmates who are identified as needing additional assistance in self-care due to a mental illness. Residential Drug Abuse Program (RDAP): FCI Waseca houses a Residential Drug Abuse Program (RDAP). It also offers a Drug Education Program and a Non-Residential Drug Abuse Program (NR-DAP). Some inmates are mandated to take Drug Education based on their documented use history, judicial recommendations, and/or violation behavior, but all other programs are voluntary. Education Services: FCI Waseca provides literacy, GED, and English-as-a-Second Language (ESL) programs. The Education Department also sponsors Adult Continuing Education (ACE) classes and a parenting program. High school diplomas and post-secondary programs are available through paid correspondence programs. Advanced Occupational Education: FCI Waseca offers advanced occupational education as a Business Office Specialist, a Cosmetology Program, and the P.A.W.S. (Prisoners Assisting With Service Dogs) Program. Vocational Training: FCI Waseca offers vocational training in Horticulture and Woodworking. Apprenticeship: FCI Waseca offers apprenticeship training in Landscape Technician. Library Services: A leisure and law library are available to inmates. The leisure library offers fiction and nonfiction books, newspapers, and magazines. The law library contains a variety of legal reference materials for use in preparing legal papers. Reference materials include the United States Code Annotated, Federal Reporter, Supreme Court Reporter, Bureau of Prisons program statements, institution supplements, indexes, and other legal materials. Most of these, plus federal case law, are available on the TRULINCS Electronic Law Library computers. Inmates also have access to typewriters and a copy machine. UNICOR: The FCI Waseca UNICOR facility produces clothing and textiles. Commissary: Inmates are allowed to buy commissary items such as food, drinks, clothing, electronics, and other items. A $360.00 monthly spending limit is imposed, which does not include the purchase of copy cards, postage stamps, or over-the-counter medications. Recreation Services: FCI Waseca offers a wide variety of athletic and leisure time activities for the inmate population. In addition to a full sized gymnasium, there are other indoor workout areas for aerobics, exercise machines, spin bikes, stretching, and yoga. There is a large DVD library with workout and fitness videos available for check out, as well as basic nutrition DVDs. Outdoor recreation areas offer a variety of activities, including racquetball, volleyball, bocce ball, tennis, frisbee golf, basketball, horseshoes, a multi-purpose field, and a large walking track which is open year round. A variety of wellness classes are offered in the Recreation Department to address general wellness, nutrition, and fitness. In season, the Recreation Department offers an opportunity to participate in a Community Flower Garden.